I probably can’t even count how many bits I’ve used/owned over the years. Start between “a lot” and “a ton” and go from there. It started with my show days and went from there. 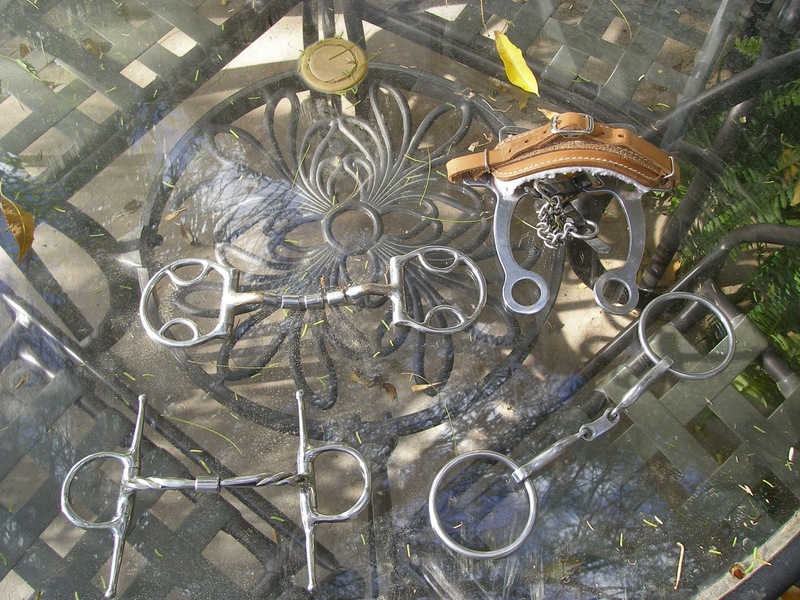 I think I probably used seven or eight different Western bits over the years, starting with a snaffle and very quickly moving into all manner of ported/shanked leverage bits. The joys of a young pony with no brakes and a young rider with no upper body strength. Shortcuts R Us. But I didn’t know any different at the time. I was still trying to figure out how to ride a young horse, let alone train one. English was easier…very quickly moved into a kimberwick and stayed there for pretty much our entire show career. But distance riding really fed my bit obsession. Mimi’s always been a bit fussy. She has a low palate and a tiny mouth, and spends half of her time evading the bit rather than working with it. My trainer and I spent a lot of time swapping out bits, trying to find one she would work in. Fortunately, I learned my bit collecting ways very well from my trainer, and she had an entire box of bits to raid. Distance riding also expanded my horizons and really furthered my education. For the first time, I was really examining the why of things, instead of accepting that something was “traditional and always done this way.” Bit function was one of those areas of education, and that exploration brought me to the Myler bits. I’ve gradually gotten rid of all of my other bits in favor of just keeping the Myler ones. I really appreciate their form and function and how they’re designed to work with the horse. I feel like I end up with more of a connection and softer feel of the horse’s mouth. I barely use any of the bits I have. As mentioned, Mimi really doesn’t like bits. She tolerates the Myler ones. But she prefers to go bitless. Remember that S-Hack I mentioned earlier? Yep. That’s her preferred headgear of choice. 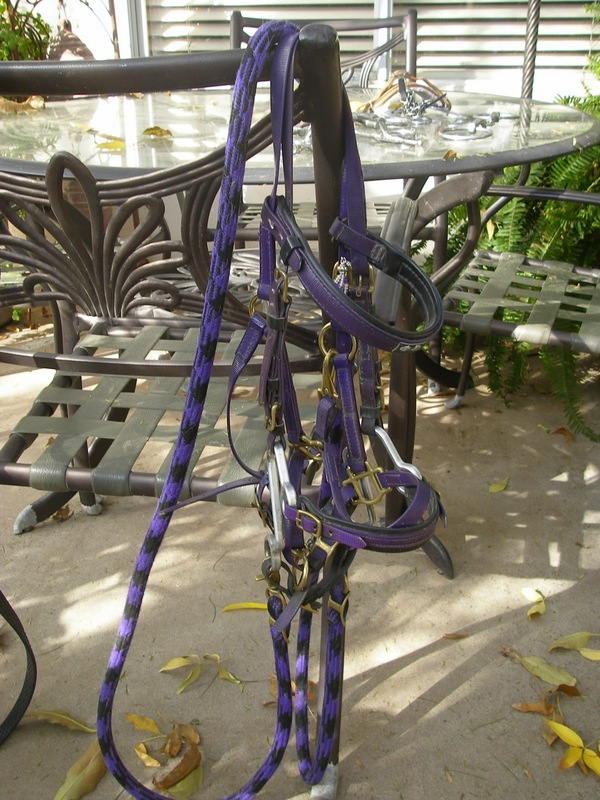 It sort of looks like a jumble of purple spaghetti, but that’s Mimi’s trail bridle. 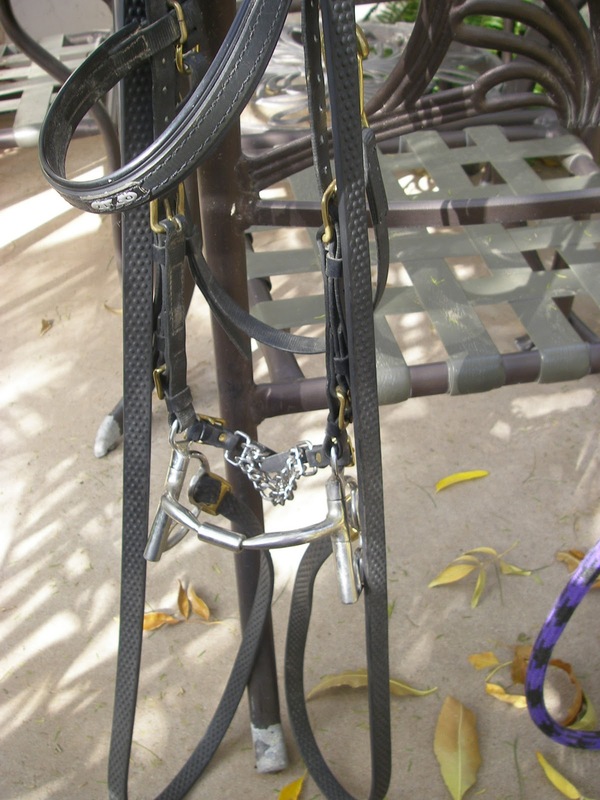 Zilco Deluxe Endurance Halter/Bridle with the Wind Rider Aluminum S-Hack and Hought Beta-Biothane Noseband. My major caveat on the hack: I prefer to use it on a horse that’s already well-schooled in giving to pressure and going along nicely in a bit. Mimi responds really well to it, and I think a lot of that is due in part to the fact she’s just happy it’s not a bit, and therefore will cheerfully obey without fuss. It still took me a couple of years of doing NATRC to work up the nerve to try it on her at an actual ride. She did great when I did finally use it, but then right about that time I started getting involved in endurance, and the idea of the faster pace and more race-like environment had me scrambling back to my comfort zone of a bit for our first year of endurance. October 2007, I used the hack on her at a ride, and haven’t gone back to a bit since, except for schooling. My preferred set-ups for schooling at the moment. Myler Kimberwick with Comfort Snaffle mouthpiece (MB02). It’s considered a “Level One” (mild, typically used for intro level) mouthpiece. I like that it acts very much like a double-jointed snaffle, but it has less “play” in it and it’s less work for the horse to hold it in their mouth. I pulled off the regular kimberwick curb chain and replaced it with a biothane curb chain, because 1) the constant jingling from curb chains annoys me and 2) I’m lazy and hate having to always fiddle with the on/off of a curb chain. 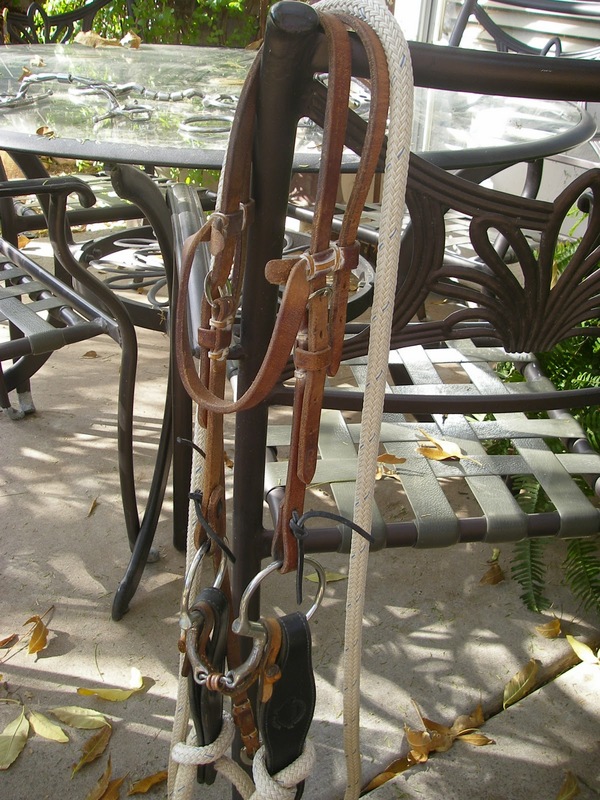 I like the ability to switch between the curb and snaffle setting on a kimberwick. When I was competing with this bit, I’d often start with the reins clipped to the curb setting, then switch to the snaffle setting after she settled down and quit pulling. My only grumble is that they only stock the kimberwick in 5″ sizes. Myler bits tend to run just a touch on the large side anyway, so 5″ is really too big for pony’s pea-head. They do custom orders , but I use a bit so little now that it hardly seems worth it. And then I’ve got several “homeless” bits…ones that live in my drawer of extra tack, ones that are either similar to something I’m already using, or have been tried and discarded as absolutely unsuitable by the Pony Committee of One. And of course, I have a couple other bitless rigs floating around as well. This one’s a vosal…mechanical interpretation of the old-time rawhide bosals. I’m on the fence about this one. Definitely a lack of fine-tune control. No side-to-side lateral control whatsoever. I still keep it around, though. Not pictured is a traditional sidepull. Well, the braided nylon variety of traditional. It lives down at the barn as my “backup” headgear, but I rarely use it other than for aimlessly wandering around the arena for a few minutes. Requires way too much force to get Mimi, in a strong-and-opinionated mood, to listen to it. But I keep it around because it’ll probably be a good young horse training tool in teaching them to give to pressure. But Mimi needs a little more authority in the form of the curb chain and leverage of the S-Hack. – Myler Combo Bit with triple barrel mullen mouthpiece. I didn’t care for this bit at all. It was too fussy to mess with, harder to use with a halter-bridle on pea-headed ponies, and it just seemed like it was too much at one time. Mimi hated it and fussed a ton with it on. Down the road it went. – Myler Kimberwick with Forward Tilt Ported Barrel (MB36). I liked the comfort snaffle mouthpiece better. This was one of their Level 2-3 bits, and it was a lot of bit. It was great for the arena, but I tend to have “controlling hands” when out on trail, and prefer to ride with a mouthpiece that is a bit lighter and doesn’t give them so many signals at once. Plus, I don’t think Mimi’s tiny mouth accommodated the more forward set of this particular mouthpiece. Didn’t see the sense in leaving it around, so…sometimes I wish I’d held onto it, jsut in case I need it again. 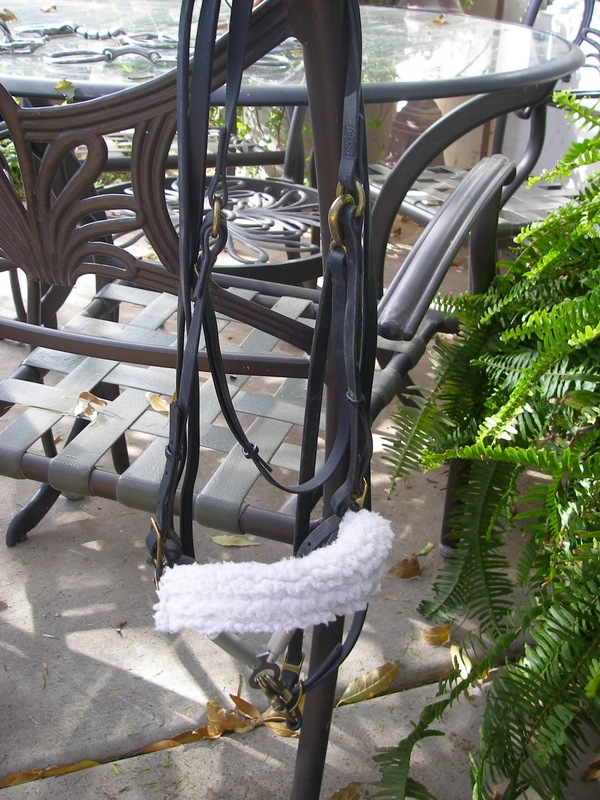 – Dr. Cook’s Bitless Bridle. As far as bitless goes, not my favorite option. Used it on the latter half of a NATRC ride and spent that seven-or-so-mile loop feeling like I was getting the proverbial middle ringer from the pony as she gleefully barged through it. Nice. Also didn’t like the fact that it was tough to get it to release the pressure once it was tight. It found a new home pretty quickly. To a lesser degree, I passed some of the bit interest along to Dad. His horses have been less complicated. Lucky him. His Foxtrotter mare Kelly came to us with a good old Tom Thumb snaffle and a habit of head-tossing. Gee, wonder why? We quickly swapped her over to a Myler short shank comfort snaffle and the head tossing really settled down, then several years later, put her in the same Myler kimberwick as Mimi. She really loved that bit, and when she went to her new home, we sent the bit with her in an effort to keep her happy and encourage the new owners to keep using said bit. I wondered if my bit debate inspired yours. I've been looking at the myler bits recently and your post gave me stuff to think about. Rose so loves her schooling bit that today I switched it onto the trail bridle so I can school on the trail. Now just to find a suitable replacement so that I don't only have just the one bit that doesn't drive my pony batty. I checked out your pictures by the way. Rose's favorite bit looks like a loose ring version of your cowgirl bit. Sweet iron and copper roller. She plays and drools and isn't fussy when I ask for anything besides full speed ahead. It's definitely satisfying when you can find a bit they like and don't fuss over. Ha! I was in on that trend, too. Weird how that seems to happen. I haven't tried the PeeWee bit, but the concept looks interesting. That seems to be a big challenge in working with smaller horses — it's really hard to find bits that fit right, where everything about the bit is smaller, not just a narrower mouthpiece.